Clean the palak and take out the leaves. Discard the stem. Blanch (Put in hot boiling water for 2 minutes, drain completely and run under cold water) the palak and grind it alongwith green chilly to a puree. 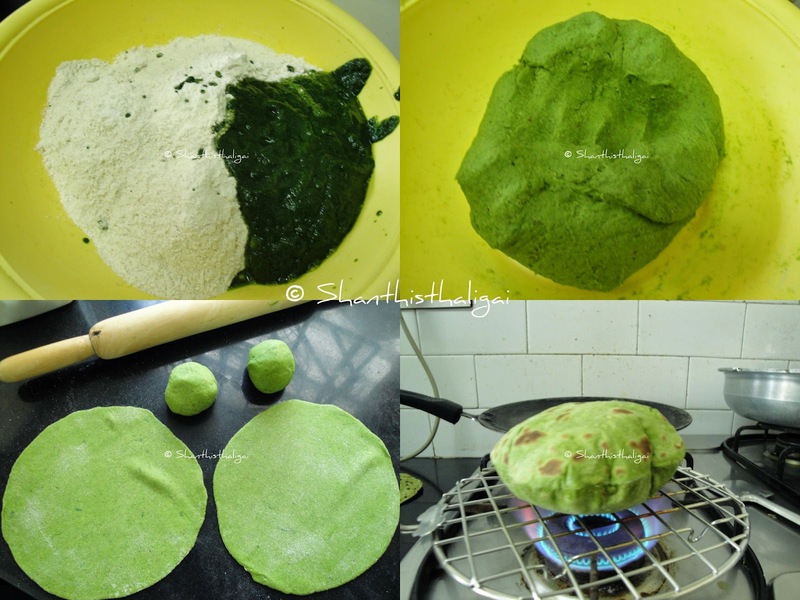 Take an easy to knead bowl, put in the atta, palak puree and salt, mix it to a medium-soft dough. Add very little water if necessary. Knead well with your palm and fist it until soft. Keep aside for 20-30 minutes. Make small balls out of the dough. Take a ball, dust with little flour(atta), and roll out to a chapati. Meanwhile, heat a skillet and when hot, place the rolled chapathi on it. When the colour changes slightly, flip it to the other side. When you see small bubbles forming on this side, take out using the tongs and put the first side down on the roti grill which is placed on direct high flame OR you can put it directly on open flame using the tongs. When it puffs up, roast the other side. Take it out from the grill using the tongs and brush with ghee for added taste. Serve hot. Healthy and definitely beautiful phulkas there. Nice combo with spinach...neat presentation.